Simply plug your Motorola Vehicle Power Adapter into your car's vehicle power socket and connect it to your phone - enjoy unlimited talk and standby time, while your phone is charging! Fits most in-vehicle power port sockets. The Motorola Vehicle Power Adapter P510, manufactured by Motorola is compatible with the Motorola V3, V3a, V3c, V3i, V3m, V3t, V3r, V3xx, RAZR Maxx Ve, Q, Q9m, C290, SLVR L7c, SLVR L7, SLVR L6, SLVR L2, PEBL U6, Nextel ic402, Nextel ic502, Nextel ic902, V190, V195, V235, V325, V360, V365, V323, V323i, W315, RIZR Z3, KRZR K1, KRZR K1M and W385 phone models. Vehicle Lighter Adaptor (12~24v DC). 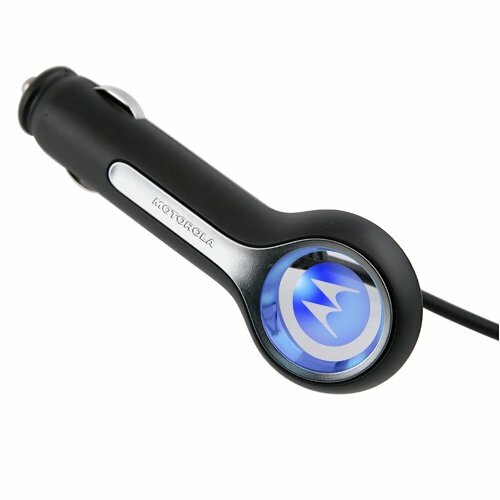 Car charger connects cell phone to any vehicle's 12 volt power outlet so that the phone can be used and powered simultaneously on the road. Includes smart IC chip that recognizes a fully charged battery and automatically switches to saver mode to protect against overcharging and short circuit. LED indicator shows charging status. top notch charger without the price !